Dancing in the Rain: How much TMI can a marriage handle? 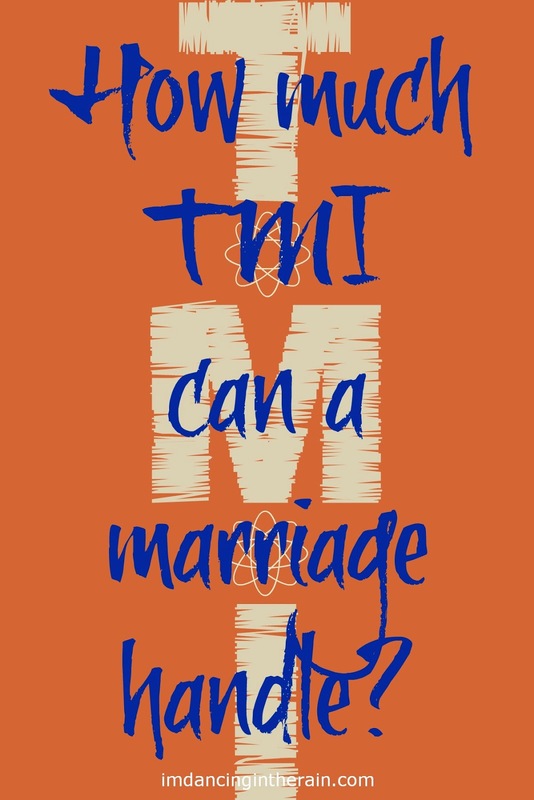 How much TMI can a marriage handle? In the beginning of a relationship we try to keep our bodily functions private so as not to come across as crude or unattractive in any way. Somewhere down the line we get comfortable. Really comfortable. We no longer close the door when using the toilet. We let farts go without giving it a second thought. Maybe we'll say something like, "Heehee, oops, excuse me." But then even the "excuse me"s stop. It turns into, "I can't help it!"s. Men adjust their junk, women reposition their bras. Scratching, picking, nose-blowing, pimple popping....coughing, sneezing, farting, peeing, pooping, bleeding (menstrual and otherwise)....vomiting! Not to mention earwax, eye goobers, scabs, hairs and nail biting. It's gross. Human beings are gross. My husband, God love him, picks, bleeds and claims he cannot hold back a fart. And the bleeding! If for some reason Mark dies of suspicious circumstances and the authorities come into my home with Luminol, I'm going to prison. For the record, if I wanted to murder my husband, I would have done it a long time ago. Lord knows I've had ample opportunity. Ahem. When I was pregnant with our daughter Mark thought he would NOT be watching me give birth. He planned to stay up by my head. He ended up watching, of course. And then proceeded to tell everyone who would listen that he had to get that image out of his head. Then he watched with our son too. He's also a big baby about me talking about my period. Oh he has no problem purchasing feminine products, but he does not want to know any details about cramps or flow. Yet, his grossness is just another charming part of his sparkling personality. Well I've decided that I'm no longer into sharing my private bodily happenings. Nope. I've started closing the bathroom door every time I need to use the toilet. I don't discuss my period with Mark, and I try not to fart in the same room as anyone else. I'm opting for a little more decorum in my marriage. The pendulum is swinging the other way for me. Give me my privacy, dear. I'd be HAPPY to give you yours too! How much TMI can a marriage take before you're just grossed out?